It's pretty cool to drive up to a park to see a fish swimming in the sky. There was also a Dragon kite that we stared mesmerized at the sound and the movement. "It moves like a Night Death" said Noah .. or maybe some other name of a Dragon from "How to Train your Dragon" Pint is, the thing looked alive. Now when you do Dragon dance you can;t actually fly through the air. But the kites can. 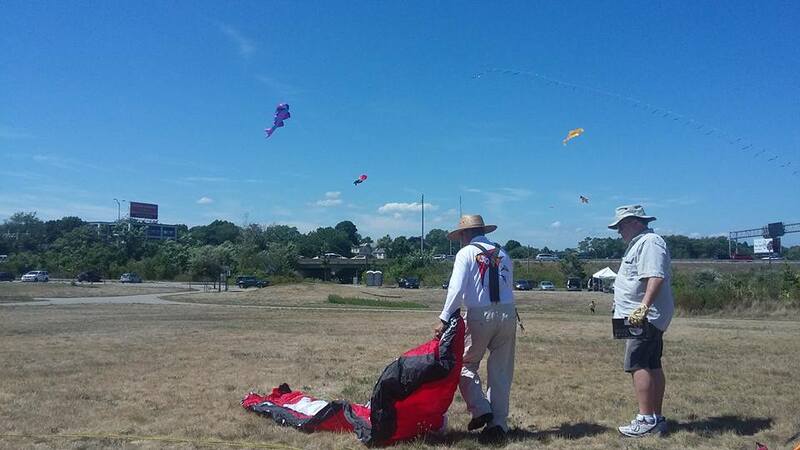 You know this festival at Pope John Paul II park in Dorchester has a lot of potential. But I was wondering if it got as crazy as a SOWA type thing would I still want to go? Right now it still has that local feel. I'm spoiled because basically the whole park is to us. I don't have to worry about my kid getting snatched. Once you get food trucks and Music blasting... then you need other types of permits first of all. But does that really make something better? For some reason it makes it more crowded. I vaguely remember some sort of Kite Fest at Copley Square as a child that focused more on Japanese kites. Part of the draw was there was a make you own kite table. But with this one, you get some really cool kites out there, and you have the space to fly them. There is usually more people on the Saturday, but so far I have only been to the second day for two years now. It's definitely something worth checking out every year.